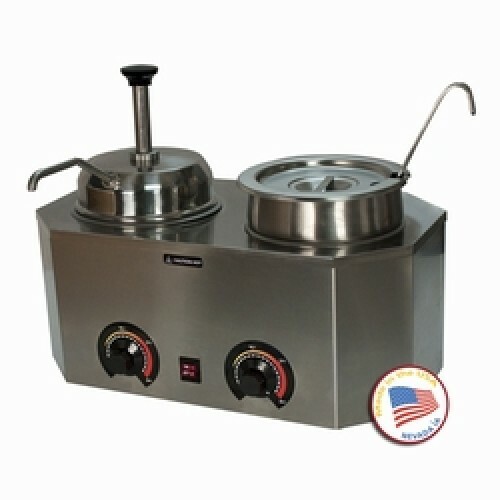 Pro-Deluxe #10 Can Dual Warmer (Ladle/Pump) - The Pro-Deluxe warmer is designed to warm product with a combination pump/vegetable jar unit. Features a stainless steel body, lighted master ON/OFF toggle switch and uses two 500 watt band element with an adjustable thermostat to keep your toppings at perfect temperature all day long. Ideal for use in convenience stores, concession stands, vending carts, break rooms, restaurants, snack bars, ice cream shops, cafeterias and more! Heats up to 200 degrees Fahrenheit and is great for nacho cheese, caramel, fudge, soups, sauces, chili or almost anything else that needs to be heated. 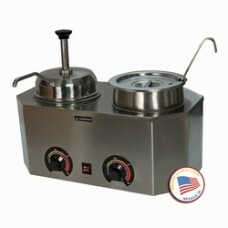 Includes pump, 1 oz ladle, stainless steel vegetable jar and lid. ETL tested and approved to UL 197 and NSF-4.